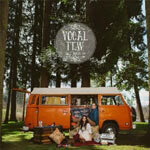 About 18 months ago, The Classic Crime front man Matt MacDonald and his wife Kristie released a four track EP under the name Vocal Few to help raise funds for the start of their family. Well, the MacDonald's are expecting their next child, and since the first EP was received so well, why not do it again? And so we have the Tall Trees EP. The pair opens their sophomore project with "The Road," a track that marries acoustic guitars and piano keys, laying them over verses about making the best of each day. Up next is "Misunderstood" and "Good Enough," arguably the best songs on the little sampling. Both are beautifully written and carry lyrical content like "Because at my best I'm a filthy sinner and at my worst I'm misunderstood" and "Cuz all that you've learned from love is that you weren't good enough, but all that you've heard is wrong." Later on, "Simple and Free" is a nice upbeat, catchy song which can easily be sung along to, and "Wild I Am" is a more personal track about thinking outside the box and being the kind of person who takes risks: "But if you tame the beast in me, then I would not exist." Another highlight would be "One Day Soon," where Matt sings about the joys, tears, and experiences in raising a child. Overall, Matt and Kristie harmonize to make a great sound with wonderfully written content. Any fan of the indie sound is sure to enjoy this release.